Accreditation is a peer-reviewed continuous quality improvement process in which the services and operations of an institution are examined by a third-party accrediting agency to ensure that applicable standards are being met. Why is accreditation important in postgraduate medical education (PGME)? Accreditation plays an integral role in the future of both the postgraduate medical education program as well as the postgraduate medical trainee. Residency programs at each university must be of such quality in order to ensure that their trainees meet the competencies required of physicians to serve Canadians in a professional, safe, and healthy manner. Why is accreditation important to me? Accreditation is an opportunity to promote your program’s strengths and identify areas for improvement. Accreditation is meant to improve the quality of your residency education. It seeks to ensure that all necessary resources are available and utilized efficiently and effectively to enable residents to meet the training requirements of their specialty, subspecialty or area of focused competence. Which bodies are responsible for PGME accreditation in Canada? In Canada, the process of ensuring PGME program quality is accomplished through the certification Colleges: the Royal College of Physicians and Surgeons of Canada (Royal College), the College of Family Physicians of Canada (CFPC) and the Collège des médecins du Québec (CMQ). Their responsibility is to accredit residency programs including the sites of training. To assist Program Directors in reviewing and improving the conduct and educational quality of their programs. What does the PGME Accreditation Process in Canada consist of? The PGME accreditation process in Canada is based on a system of regular formal full University survey visits that occurs every six years. The survey visit provides a first-hand peer-review evaluation of each accredited program, and a determination of the extent to which each program meets the General Standards of Accreditation of the three Colleges. Programs on a regular six-year cycle will typically also have undergone a mid-point internal review at the three year mark led by their own institution. The Royal College, CFPC and the CMQ have developed national conjoint standards for the evaluation and accreditation of residency programs. Evaluation of each residency program are based on compliance with meeting these standards. There are A standards, which are institution level standards, and B standards, which are program level standards. The CFPC Red Book is complementary to and consistent with the B standards and will clarify or expand on the B standards as they relate to the education of family physicians. A surveyor ensures that standards for residency education are being maintained in all programs. Surveyors are part of a team that visits the medical school during the scheduled on-site process. Who are the other members of the team? The basic accreditation survey team consists of 10 or more surveyors, depending on the number of programs to be reviewed. In addition, representatives from several organizations involved in the accreditation of residency programs also attend. These include: residents from RDoC or in the province of Québec from the Fédération des médecins résidents du Québec (FMRQ); one consultant from the Association of Canadian Academic Healthcare Organizations (ACAHO); one representative from the Federation of Medical Regulatory Authorities of Canada (FMRAC); and one observer from the Licensing Authority of the province where the survey is being conducted. Residents are critical to the accreditation process, and our input is highly valued. Accreditation provides residents with a mechanism to effect positive changes in our residency programs that, in many situations, will result in significant long-term benefits.Accreditation is your opportunity to openly and honestly evaluate and help improve the quality of your residency program. The feedback you provide to the survey team will help programs to continue to promote areas of strength and at the same time, focus on areas that need improvement. Maintaining standards means maintaining excellent programs and producing physicians who are ready for practice. My program is being reviewed during the on-site accreditation visit. Complete the RDoC pre-accreditation questionnaire prior to the Colleges’ on-site accreditation visit. 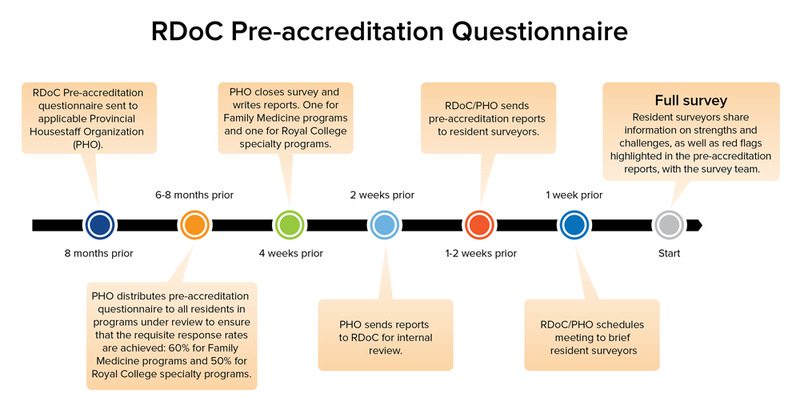 As part of the accreditation process, the Provincial Housestaff Organization (PHO) will send the RDoC pre-accreditation questionnaire to residents in a Royal College or Family Medicine program at the University, which will undergo accreditation. This questionnaire is specifically designed to obtain your perspective on your training. Results are confidential, anonymous and NOT given to the survey team, your program or faculty. The PHO will collate the results and the report is provided only to the RDoC office for review and to the resident surveyors on the Royal College and CFPC Survey teams. What program strengths do you wish to highlight? What are the areas that need improvement? What can accreditation do to improve your residency program? Prior to the visit, residents in a program should meet as a group amongst themselves, to set priorities for discussion with the survey team, establish speakers, and provide examples and documentation. Members of the survey team will meet with residents during the on-site survey visit in September. Concerns about a training program should be identified by residents prior to the survey visit (for example, at the Residency Program Committee, University-led Internal Review, or on the pre-accreditation questionnaire). The RDoC questionnaire was initially developed in 1983 and updated in 2014 and is aligned to the conjoint B Standards.The RDoC questionnaire is circulated by the Provincial Housestaff Organization to all residents in both Family Medicine and Royal College specialty programs, approximately 6-8 months prior to the on-site survey. Reports are prepared by the Provincial Housestaff Organization (one report each for Family Medicine and Royal College specialty programs) and sent to RDoC for review and then distributed only to the resident surveyors on the Royal College and CFPC survey teams. Survey results are confidential and anonymized. Resident surveyors may share pertinent, de-identified information with the survey team. The pre-accreditation questionnaire is only one tool that is available to the resident surveyors to help them understand the resident on-the-ground perspective on his/her training. What is the timeline of resident input for the on-site survey? Royal College and CFPC survey team discussions occur every evening following meetings with the programs, faculty, residency program committee and residents and, at the end of the week, the recommendations of the survey team is provided verbally to the program director at the exit meeting and the report to the Accreditation Committees of the Royal College and the CFPC. The final decision on accreditation is the responsibility of the Accreditation Committees. I am interested in volunteering as a resident surveyor. How can I get involved? Residents who are interested in volunteering as a resident surveyor are welcome to complete this expression of interest form. External review and full survey volunteer opportunities arise during the year and you may be contacted regarding your availability and interest.